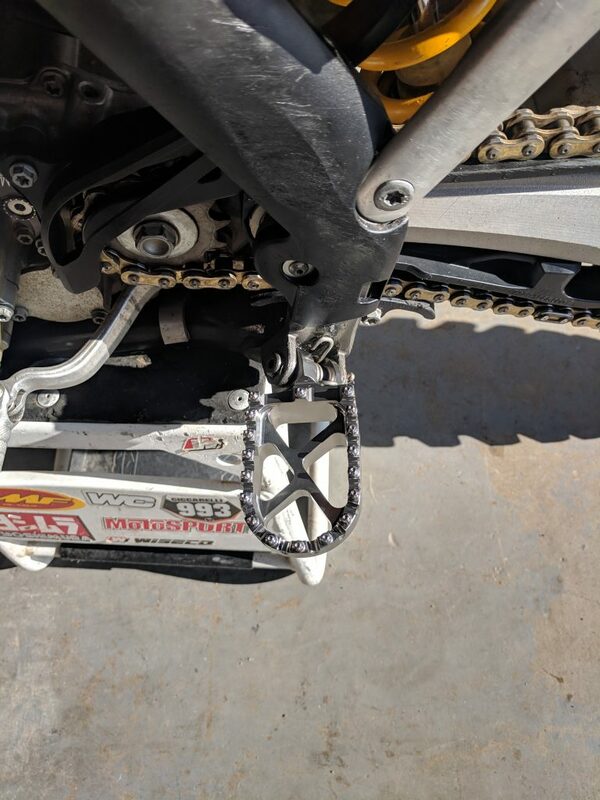 My install and review of Tusk Billet Race Foot Pegs on my 2014 KTM 450 SXF. 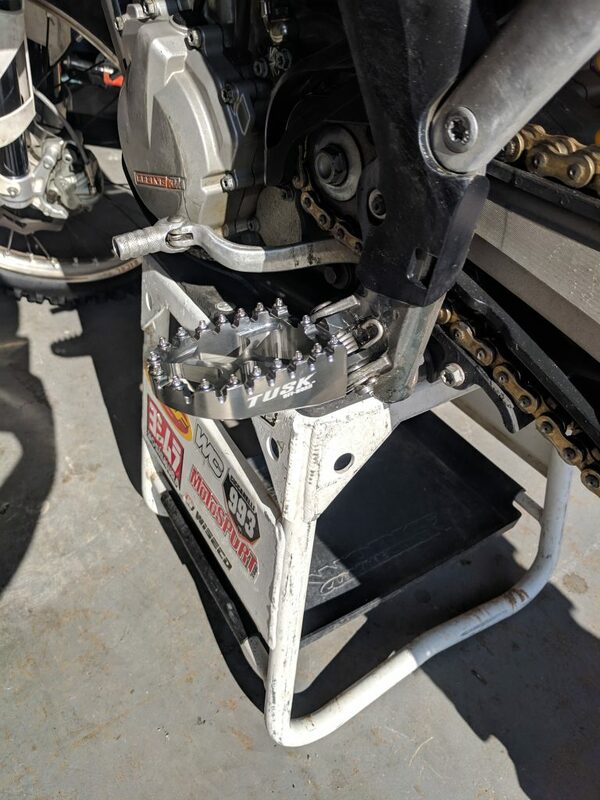 The stock foot pegs on my 2014 KTM 450 SXF have over 150 hours on them. Over time the steel teeth get worn down and you start to lose grip with your boots. I didn’t really notice it at first because it’s a slow transition to wearing down the teeth. 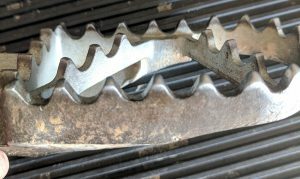 I used to take a file and sharpen the steel teeth to get a better grip. This time I just replaced them with Tusk billet race foot pegs. 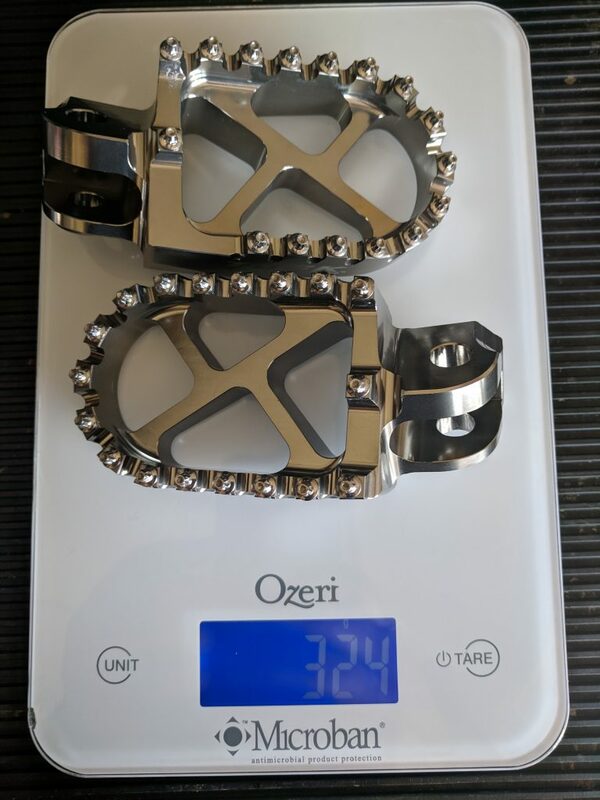 The Tusk foot pegs are a little bit lighter than the stock steel ones, plus they are a little bit wider than the stock foot pegs. Replacing them was easier than putting the work into sharpening each tooth on the stock pegs. 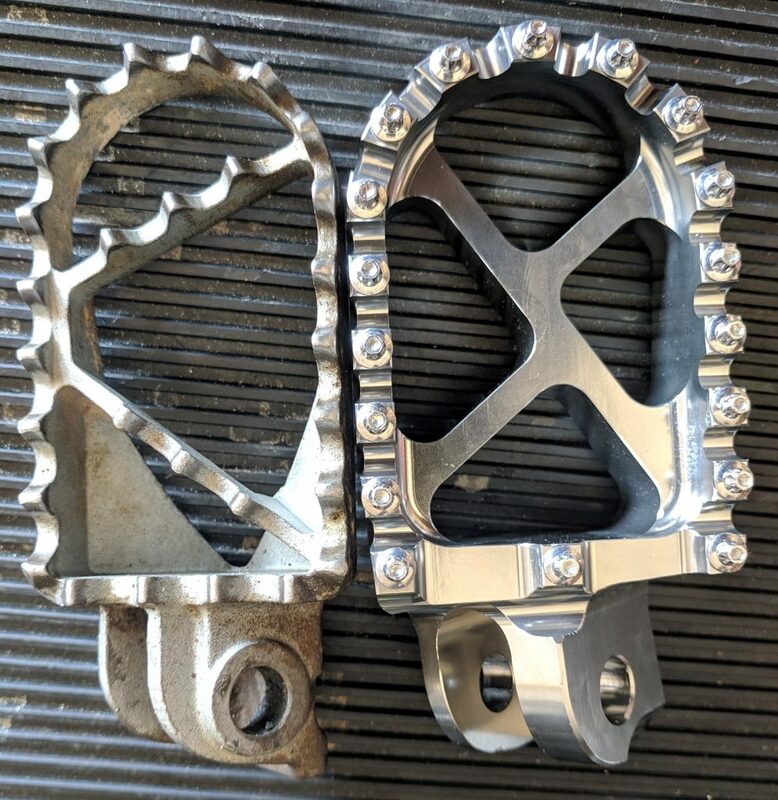 Also, the teeth on the Tusk billet race foot pegs look like they will provide better grip and not tear my boots up as much. 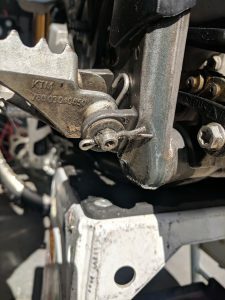 I never replaced or sharpened the stock foot pegs on my KTM 450 SXF. I’ve never ridden with anything else besides stock foot pegs and it’s been a while since I sharpened my last set. The stock steel pegs on the KTM are adequate and they lasted me over 150 hours of writing. As you can see in the photo the teeth get worn down over time. I didn’t really feel my feet slipping off the pegs but I didn’t feel my boots were gripping them either. 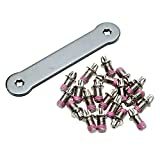 It wasn’t until I rode my friend’s bike that had aftermarket pegs on it that I realized my foot pegs need to be replaced. 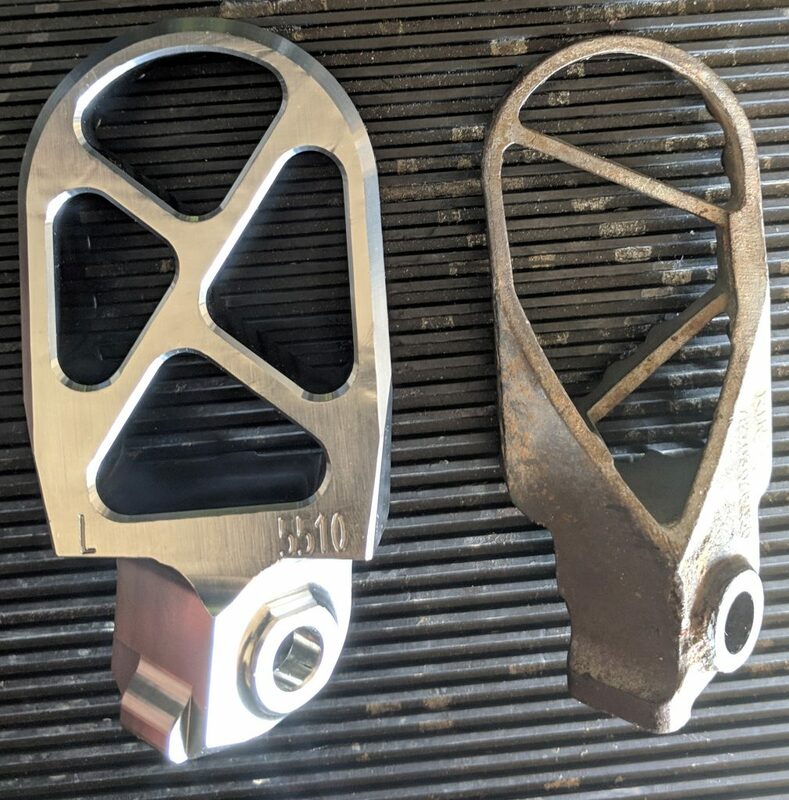 There are several companies that make aftermarket foot pegs but the Tusk billet race foot pegs are a good cheaper alternative to more expensive titanium for pegs. There are other companies that make steel replacement foot pegs that are reasonably priced. 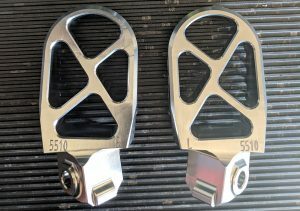 I looked at a couple but ended up buying the Tusk billet race foot pegs for their design and price. The stock foot pegs are fairly easy to take off. The pegs are held on by a foot Peg pin with a washer and a cotter pin at the end holding it on. The last part is the foot Peg spring which doesn’t get in the way of the removal. 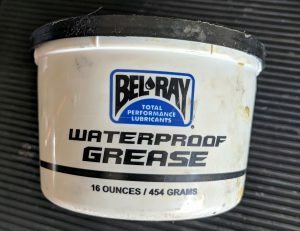 To remove the stock foot peg, the only tools that you would need would be a pair of needle nose pliers, a flat blade screwdriver, and a hammer. The first step is to just remove the cotter pin by bending it back straight. Then using the needle nose pliers and a hammer knock cotter pin out of the foot Peg pin. 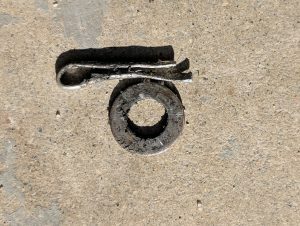 After you remove the cotter pin, there is a washer behind it. Using a hammer and a screwdriver you can knock the foot peg pin through the frame. This will release the spring and foot peg from the bike. 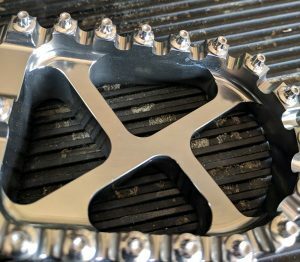 The Tusk billet race foot pegs are considered a high-performance foot peg. They feature a wide platform and special aggressive teeth that give the utmost comfort and control. The pegs are made from forged 6061 T-6 aluminum and are CNC machined. 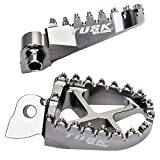 Tusk foot pegs are anodized in a silver coating to be extremely durable. The teeth are a high strength steel design that has a flat top instead of a sharp tip that offers a great amount of grip while resisting wear. The steel teeth are replaceable and you can use the Tusk Billet Race Foot Pegs Replacement Tooth Kit when they get worn down. There is a design difference between the stock pegs in the Tusk billet race foot pegs. If you look closely you will notice that the Tusk foot Peg doesn’t have any teeth on the inner section of the foot peg. All of the steel teeth lie around the outside perimeter of the foot peg. Even though the Tusk foot peg doesn’t have inner teeth, it does have more inner bracing. 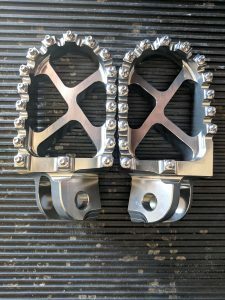 The stock steel foot pegs have a more open design and might be better for not getting packed up with mud. I ride in Southern California so this isn’t much a problem for me but the Tusk design is a little less open in the middle of the foot peg. the stock and Tusk foot Peg Heather the same length, about 3 1/4 inches (83mm), but the Tusk foot peg is a little over a quarter inch wider. 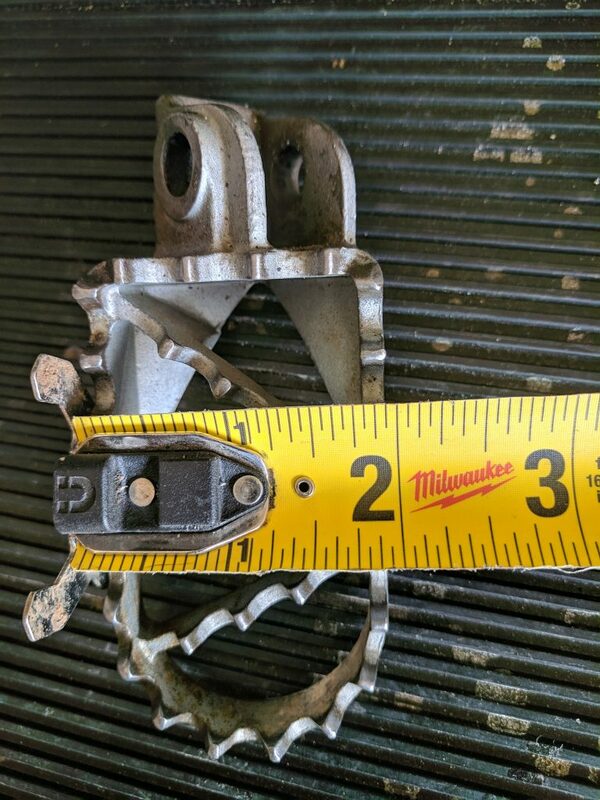 The Tusk foot peg measured in at 2 1/4 inches while the stock measured at just under 2 inches. 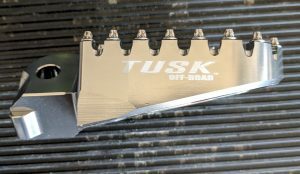 The Tusk foot pegs are 59 grams lighter than the stock steel foot pegs. 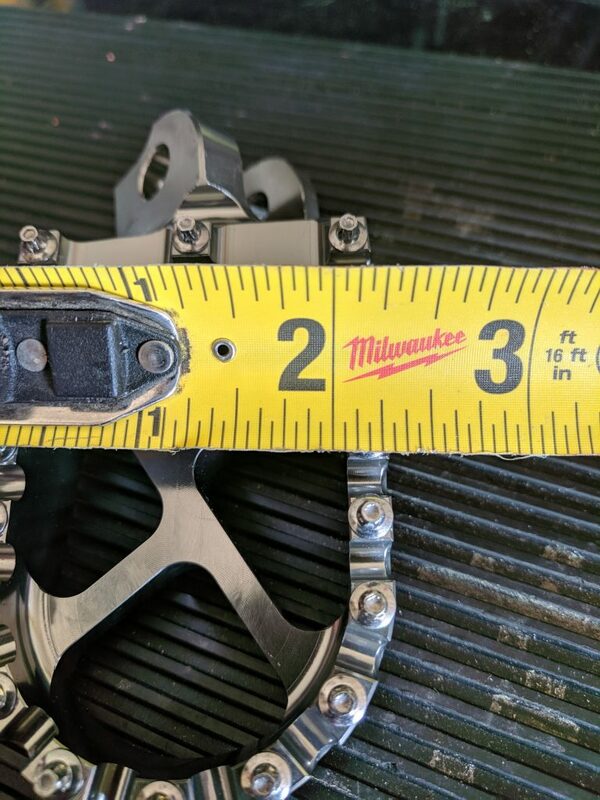 On my scale, the Tusk billet race foot pegs way to combine weight of 324 grams. 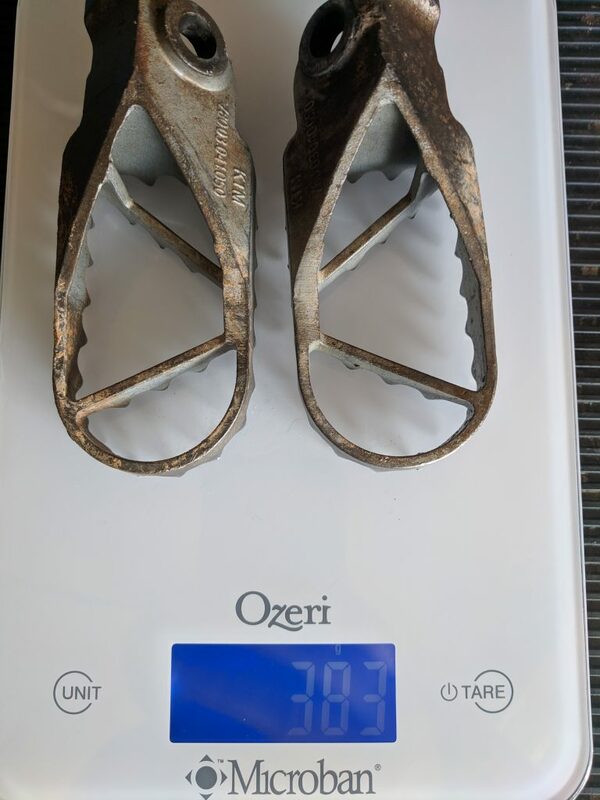 The stock steel KTM foot pegs weighed in at 383 grams. Although 59 grams isn’t a lot of weight, the foot pegs on a low point of the motorcycle and every little bit helps. You can also get titanium foot pegs that are even lighter than the billet aluminum Tusk pegs. Raptor makes a set for a key TMs but the price was over $250 and it didn’t seem worth it. Installing the Tusk billet race foot peg is as easy as removing them. I cleaned up the foot peg pin, the spring, and the frame mount before a installed the new foot pegs. 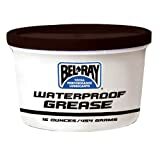 I also added a light coating of Bel-Ray waterproof grease to the foot pegs and the foot peg pin before installing. You can reuse the stock cotter pin, but I ended up replacing it with a brand-new one. I always have a box of cotter pins lying around for various things that I need for my other motorcycles. To install the pin and the spring you can use a set of pliers to hold the spring compressed while you slide the pin through it. It might take you a couple of times but it eventually will slide in. Installation took less than 20 minutes and didn’t require any special tools. The pegs look great and I can feel the difference in width underneath my boots. When riding around in choppy conditions, my feet tend to stay on the pegs instead of getting bounced off. 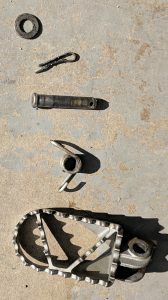 I’ve only had one or two rides but it doesn’t look like the Tusk billet race foot pegs are any tougher on the bottom of my boots than the stock foot pegs were. Overall it is a great upgrade for the price. Tusk makes various parts for motorcycles and off-road. They are house brand for Rocky Mountain ATV/MC. Tusk tends to be budget replacement piece but I’ve used them over the years and they have held up well. Tusk also makes various specialty tools for motorcycles and dirt bikes.